Travel the globe without ever leaving the Louisville property. It’s simple to visit the world’s animals with a trip to the Louisville Zoo. Amazing exhibits replicate authentic habitats from around the globe. Geographically arranged, folks get a feel for each region’s wildlife as they meander through. Saunter down to South America. View spectacular Snow Leopards, Jaguars and Maned Wolves. Nearby in the Cats of the Americas the Canada Lynx and Puma are prowling around. Bald Eagles shake their tail feathers here as well, ignoring the cats as only they can. Animals that thrive on exotic islands can be seen in the Islands zone. Creatures great and small roam this part of the Louisville property from the Victoria Crowned Pigeon to the Malayan Tiger. Seek out an endangered toothy Cuban Crocodile and laugh out loud at the antics of the residents of Penguin Cove. It’s cool in the pool at Glacier Run. The arctic scene is set complete with Polar Bears, Grizzly Bears and Snowy Owls. Siberian Tigers slink about in the Alice S. Etscorn Tiger Tundra where guests can view them up close and personal during training sessions. Things are always hopping down under in the Australian exhibit. Sounds and sights are sensational in the Wallaroo Walkabout. 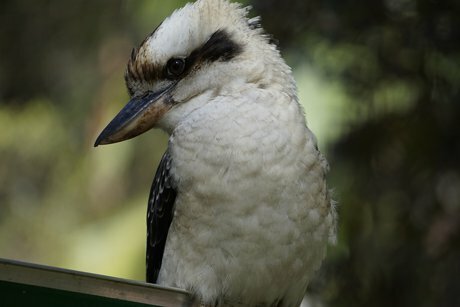 Laugh with a Kookaburra and mingle with Wallabies and Wallaroos. Don’t forget to say hello to Bob the Emu on the way out. Nearby make friends with colorful Lorikeets. They are eager to partake in meet and greets especially when cups of nectar are involved. Walking along the turf in Africa is always a wild time. Lions laze about the day letting out a lazy roar or two. Jump right into jungle territory when exploring Gorilla Forest. Here the mighty Silverbacks make their Louisville home. Elegant Elephants are awe inspiring. Watch them interact in the Elephant Encounter. The Louisville Zoo is open daily so spontaneous trips are always possible. Hours are seasonal and should be checked online prior to arrival. Those who like to plan ahead of time can view a map of the grounds. This often helps with decision making on whose favorite animal to see first. A full list of inhabitants of the Louisville Zoo can be found here.